Kinetic sculpture of Theo Jansen – FOP Shvachko V. V.
Since 1990 Theo Jansen, Dutch artist and kinetic sculptor, builds huge structures that resemble skeletons of animals which are able to move under the influence of wind on the sandy beaches. These structures are known as Strandbeest (Dutch: strand = beach; beest = beast), wind-walking examples of artificial life. Jansen calls them “animals” or “creatures”. These large mechanisms are made of Polyvinyl chloride (PVC) pipes and bottles, wood, and wing-like sails. Jansen strives to equip his creations with their own artificial intelligence so they can avoid obstacles by changing course when one is detected, such as the sea itself. The creations are also able to store air pressure and use it to drive them in the absence of wind. The legs system is based on the planar mechanism that is designed by Jansen to simulate a smooth walking motion (Jansen’s linkage). This mechanism consists of 8 links and transforms the simple rotation to the curvilinear motion of parts that is similar to movement of the walking leg of human or animal. Jansen’s animated works are a fusion of art and engineering. His creations are constantly being improved and have become excellently adapted to their sandy beach environment. 1. STRANDBEEST. – Mode of access: http://www.strandbeest.com/. 2. Theo Jansen. – Mode of access: http://en.wikipedia.org/wiki/Theo_Jansen. 3. Янсен, Тео. – Mode of access: http://ru.wikipedia.org/wiki/%D0%AF%D0%BD%D1%81%D0%B5%D0%BD,_%D0%A2%D0%B5%D0%BE. 4. Jansen’s linkage. – Mode of access: http://en.wikipedia.org/wiki/Jansen%27s_linkage. 5. File:Jansen Theo Strandbeest Oper.jpg. – Mode of access: http://it.wikipedia.org/wiki/File:Jansen_Theo_Strandbeest_Oper.jpg. 6. 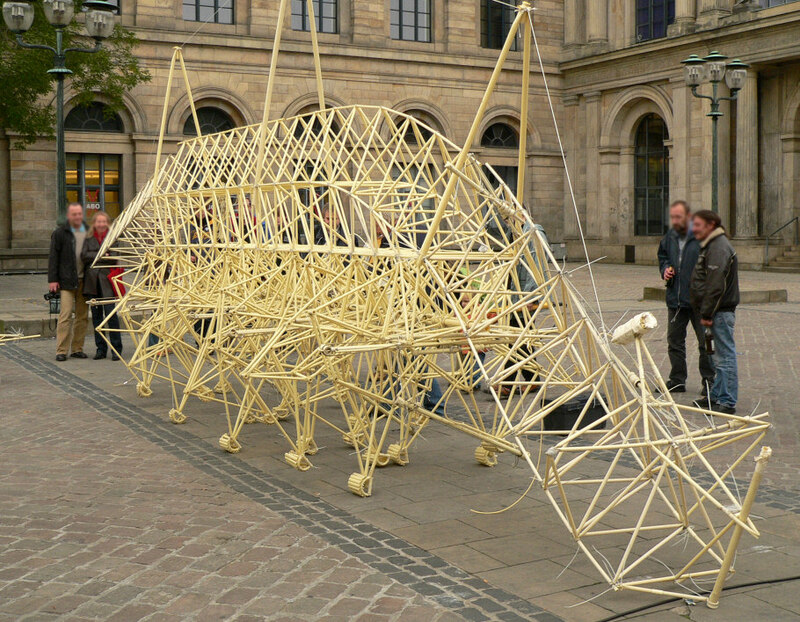 File:Jansen-Strandbeest crop.jpg. – Mode of access: http://en.wikipedia.org/wiki/File:Jansen-Strandbeest_crop.jpg. 7. Man creates kinetic sculpture that moves and lives on its own. – Mode of access: http://www.wimp.com/kineticsculpture/. 8. Jansen Linkage – Klann Linkage Comparison. – Mode of access: http://www.mechanicalspider.com/comparison.html. 9. DraCAEna v.2.1. – Automated system «DraCAEna», Copyright (C) Vadym Shvachko. – Mode of access: http://shvachko.net/?page_id=2165. 1 Author, Axel Hindemith, released this work into the public domain.